I am having a love/hate relationship with my blog right now. I generally love to blog. I can check out my stats, which is pretty cool but can become a sad obsession. It looks boring. A “custom” banner and a white background? BORING. Adding pictures can be kind of a pain. Though I like blogging, I haven’t had time. I check my stats almost obsessively. I can be me, but it doesn’t really say MEEE! So I promise myself and Chris too, once finals are over (JUNE 8th) and I can be fairly normal again, I will find a way to turn this into US. I will take a million more pictures and actually blog them (look for blogs about Heather and Brandon’s engagement party and ZAMA soccer). In the mean time, I’d like to share a bit about what’s been going on in our lives, since I haven’t really had the chance to blog about all the bloggable things in our lives. We each have developed our own new obsession this last week or so. I have logged in many hours on Etsy.com because apparently I heart hand crafted things, especially jewelry. I am waiting patiently for my four, yes FOUR necklaces that I have ordered in the last week. 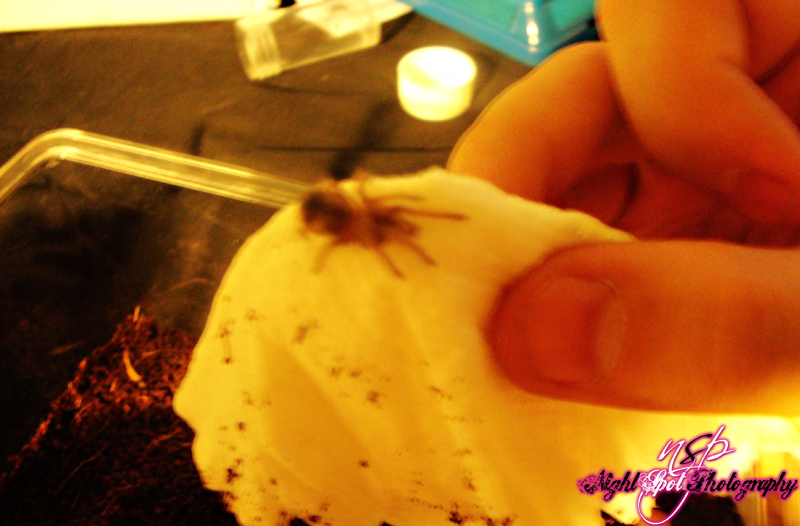 Chris received two tarantulas in the mail this week, two tiny spiderlings, courtesy of The Invert Shop. I wasn’t thrilled with the idea of these 8 legged creatures growing old with us, but they’re kind of cute in a gross and weirdly fascinating way. Unfortunately for us, we lost one. So our little smithi is somewhere and we don’t know if he’s dead or alive. Chris is pretty bummed about it, but he’s already ordered another smithi and another one to our fast growing collection of things that crawl. I can thank Dr. Kaae from Cal Poly Pomona for getting Chris (a former arachnaphobe) into these creepy crawlies. Because I have been sick and now Chris is too, we haven’t been making it to the gym every day. I love having that routine and hate that we’re breaking it, but I love going into work and not feeling like I’m going to fall asleep, since we don’t get home from the gym until at least 11. This is what our iPad has looked like for the last week. Because this has been an incredibly stressful school year for us, we are taking a much needed Vegas trip the day after my LAST DAY OF WORK. We will be spending a couple of days enjoying each other without the stress of school, work, or even home. We are going to indulge in a couple’s massage and good food, but not without using the hotel’s fitness center. Also, we are planning on making it out to Massachusetts for Chris’ friends wedding. We were hoping to make it a nice long trip, going out to New York, but we really have to plan it out, and make sure its cost effective. We are 8 days from finishing out first year at Cal Poly Pomona and I am 21 days from ending my TA career for now. That means 21 days from focusing on our photography, but in the mean time I’m still snapping away and on June 17th we’re going to the Showit Freedom Tour. Megan, I obviously I didn’t get to work, I did this instead, but I promise I’ll work on the paper now. MAYBE.